For a full list of campus coal plants, go to Existing campus coal plants. In 2004, new regulations were enacted affecting as many as 100 coal-fired boilers on 60 college campuses, among more than 3,000 coal-fired industrial boilers nationwide. The regulation -- National Emission Standards for Hazardous Air Pollutants for Industrial/Commercial/Institutional Boilers and Process Heaters, or Boiler Maximum Achievable Control Technology (MACT) -- is intended to reduce hazardous air pollutants (HAPs) by controlling particulate matter, hydrochloric acid and mercury. It was scheduled to take effect in February, 2007; however, that deadline was extended to September 2008. Along with student backlash against campuses directly powered by coal-fired plants, there has recently been a campaign for universities to drop their stocks from the fossil fuel industry. This began in 2010 at Swarthmore College when students became infuriated by systemic inaction at the federal and state level against mountaintop removal mining practices. They decided to target their board of trustees, arguing that it is morally wrong to invest money in companies that destroy mountains and pollute the air, water and land. Since 2011, thousands of students, religious leaders and elected city officials across the country have taken up the same logic, leveraging divestiture as a tactic to target the reputation of the fossil fuel industry, whose business model relies on mining and burning five times more carbon than scientists agree is safe to burn to avert runaway climate change. 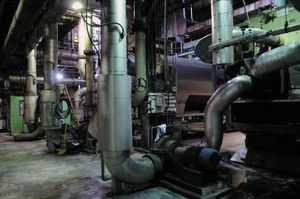 In February 2009, Ball State University's Board of Trustees approved a proposal to phase out the campus's four existing coal-fired boilers and replace them with geothermal energy. The phased conversion will take place over a five to ten year period with a total cost of about $70 million. The university is seeking state approval to use $41.8 million in existing funds, which were originally designated for replacement of the coal-fired boilers, to develop the geothermal system. "A decade ago, the University converted its coal-fired power plant to a highly efficient co-generation plant fueled by cleaner-burning natural gas. The plant now generates 95 percent of the electricity consumed on campus and in off-peak times actually distributes electricity to the power grid. It also captures the heat from the combustion process and converts it to steam used to heat much of campus. As a result, greenhouse gas emissions from the plant are 45 percent below the pre-1998 level. All of the electricity the University purchases from outside sources comes from only wind power." The College of Wooster, in Wooster, Ohio, runs a 375 kW coal-fired cogeneration facility. The facility - a topping cycle, backpressure turbine driving an induction generator set - was converted to cogeneration in 1992, and now produces both electricity and steam for the campus. Wooster's cogeneration system produces about 1,280 MWh of electricity per year. In early 2010, the university stated that approximately 20 per cent of it's electricity was derived from coal fuel but that it it intends to eliminate coal in 2011, which would cut its greenhouse gas emissions by 28%. Located off Coal Pile Drive, Duke University's West Campus Steam Plant burns 54,000 tons of coal annually from mines in West Virgina and Kentucky. The plant also burns oil and natural gas. The plant was built in 1929 and produces 1.3 billion pounds of steam per year. The plant has three boilers and is equipped with baghouses that reduce soot and ash by 97.3 percent, according to officials. According to school officials, Duke will spend $4.5 million to add “lime scrubbers” to the system that will remove gases and heavy metals. These improvements keep the plant in or ahead of environmental compliance requirements. The plant produces 8,000 tons of ash per year. In 2008, Duke approved a $20 million revovation of the East Campus Steam Plant, was built in 1929 and closed in 1978. When that renovation is completed, the East Campus Steam Plant will produce steam with natural gas, and the West Campus Steam Plant will reduce its coal use by 70 percent. According to Tavey Capps, the University's environmental sustainability coordinator, Duke intends to stop burning coal altogether in the next five to ten years, "depending on the economic environment." Eastern Illinois University Plant is a coal-fired plant built in 1925. In 2009 the University submitted permits for a new biomass facility to replace the coal plant, including possible wind turbines. The new plant will be a “biomass gasifier” that will fill University heating and cooling needs by burning nontreated wood chips obtained as lumber industry by-products. The proposal is the largest project in campus history in terms of the dollar amount. In May 2009, Hampton University in Virginia announced a proposal to replace its coal-powered steam plant with a geothermal heating and cooling system. School officials filed a request for $15 million state energy grant. The project has an estimated cost of $35 million. The steam plant was built in 1886 and renovated in 1946. The conversion would eliminate approximately 50,000 tons of carbon dioxide emissions each year. 1,331 tons of sulfur dioxide. 385 tons of nitrogen oxides. 76 tons of fine particulate matter, or soot. Almost two tons of volatile organic compounds. The 68,000 yearly tons of coal used at the plant is mined by Peabody Energy, which trucks the fly ash from the plant back to mine sites. In 2005, at the prompting of the state legislature, IU studied outsourcing the heating operation but rejected the idea as more expensive than retaining the coal-fired plant. The university also concluded that switching to natural gas would increase fuel costs by $12 million to $15 million a year. In 2007 the university undertook at $34 million project to replace two 1950s-era coal boilers with natural gas, and to add scrubbing technology (lime and activated carbon injection) that would sulfur dioxide emissions by 45% and mercury emissions by 50%. According to university officials, the project would meet the requirements of MACT. A university website describes the IU coal plant as follows: "The coal plant at the Indiana University Bloomington campus burns 60,000 tons of coal each year. It is all stoker-grade Indiana coal with moderate sulfur content burned at 11,200 Btu per pound. The plant generates steam for heating, cooling, and processes, such as cooking or for research uses." In January 2012 Coal Free IU launched a three-day campaign to alert students about the negative effects of the coal plant on their campus. Members will protested IU’s use of coal by spelling out the words “no coal” in an aerial art display in front of the coal plant on campus. The group also sponsored Thursday’s IU vs. Minnesota men’s basketball game. The week of action culminated in the delivery of more than 5,000 petitions to IU President Michael McRobbie that urged him to end the use of coal at the school. Iowa State University Power Plant is a coal-fired power station owned and operated by Iowa State University on Iowa State campus in Ames, Iowa.The plant uses 155,000 tons of coal and generates 28,000 tons of coal ash per year. In April 2009 students from Environmental Watchdog and ActivUs along with several faculty members protested the plant, calling on the University to run the plant on renewables. According to Assistant Director of Utilities Jeff Witt, coal will be part of the system for the foreseeable future, but the University is making steps toward supplementing the coal with other forms of energy over the coming years, such as purchasing up five megawatts of power from a wind farm near Ames, roughly equal to 7 to 8 percent of campus demand. According to a report in Sierra Magazine: "The SSC [Sierra Student Coalition] is campaigning against the three [Iowa] schools' practice of depositing their coal ash in unlined quarries; the fear is that its many toxic components will leach into local aquifers. Last year, student pressure led to voluntary groundwater-monitoring programs, but coal-waste policies remain unchanged. Miami University's Steam Plant in Oxford, Ohio, is located behind Peabody Hall on Western campus, and supplies the University with all of its steam through burning coal. In October 2007 the University spent $17 million to comply with tightening emissions legislation within the EPA's Clean Air Act, such as installing scrubbers to lessen sulfur dioxide emissions. To dispose of waste from the plant, the University has been talking to a company called N-Viro about taking fly ash from the burnt coal and mixing it with coal sludge to form a fertilizer for farmers. The EPA is currently considering whether to designate coal ash as a hazardous waste. Students have formed the Miami University Copenhagen Committee to urge the school to transition away from coal and lessen its greenhouse gas emissions. University officials say coal is used because it is cheaper. On April 4, 2011, Miami University President David Hodge announced the official sustainability goal of the University includes the gradual phase out of burning coal with a target sunset date of 2025. In the fall of 2008, President Andrews reported that the college had received $6 million from the state legislature to replace the environmental controls at the central heating plant, and that the work was underway. "The Hocking Valley ACG-CHP Facility addresses many of the goals and objectives of the Clean Coal Power Initiative. As a combined heat and power system using coal, it offers the potential to achieve a greater level of overall energy efficiency, lower energy costs, and reduce carbon emissions. The gasification system use 100%coal and will increase the University’s coal use by nearly 300% in providing heat and power to the campus,while significantly reducing the emissions of SO2 and NOx compared to Ohio University’s current stoker-boilers. By using oxygen-blown gasification, carbon dioxide will be a richer fraction of the gas stream, eliminating the cost of nitrogen separation in the hot flue gas, making potential capture and later sequestration possible. By incorporating a fuel cell into the system, the potential for high-efficiency, low-cost heat power may be realized. On February 3, 2011, the Purdue University Board of Trustees voted to cancel the $53 million Wade Utility Plant expansion based on financial and regulatory concerns. According to vice president of physical facilities Bob McMains, the estimated increase in fuels costs along with expected future regulations for coal waste made the expansion unworkable. School officials plan to install a natural gas boiler rather than a coal boiler to replace the existing 50-year-old Boiler No. 1. a resolution in February 2011 canceling plans to add a new boiler. Students at Southern Illinois University at Carbondale are concerned. Their school has the prize of being the only campus in the U.S. to have an active proposal for a coal-fired power plant. Led in part by a member of the Student Environmental Action Coalition’s National Council, Kandace Vallejo, the SIUC’s Student Environmental Center is standing up to the administration’s interest in investing $250 million student dollars in coal.Kandace says (from the heart of Illinois coal country), “I feel like investing the money in more coal technology is almost pointless, because within the next 100 years this entire country is going to have to transfer over to 100 percent clean and sustainable energy. We’re just going to run out of coal and oil.” And they won’t be alone - SEAC and the Energy Justice Network will be supporting the resistance. Hopefully this proposal, along with 200+ others similar to it across the country, will fall to the favor of conservation, efficiency, renewables, and simple common sense. "Following an ongoing story, we’ve got another notch in our belts and another victory against coal. Southern Illinois University at Carbondale, the only campus in the country with an active proposal for a coal-fired power plant, has canceled its plans. University President Glenn Poshard said a study suggests the plant would be too expensive. The Student Environmental Center at SIU played a role in this victory. A monthly column by an SEC member recently highlighted the problems with “clean coal”, while the SEC’s Eco-Dawgs green fee campaign has been making great advances towards sustainability on campus. The September/October 2010 issue of Sierra Magazine reported: "The SSC [Sierra Student Coalition] joined forces this year with the student group UAF Beyond Coal. Students there are pressing the existing sustainability task force to study renewable alternatives to coal." Campus Group: UGA Beyond Coal. According to a report in Sierra Magazine: "The SSC [Sierra Student Coalition] is campaigning against the three [Iowa] schools' practice of depositing their coal ash in unlined quarries; the fear is that its many toxic components will leach into local aquifers. Last year, student pressure led to voluntary groundwater-monitoring programs, but coal-waste policies remain unchanged. Built in 1909, UND's steam generating plant consumes 7 boxcars (20 semi loads) of coal per day, feeding pressurized steam into a 13-mile network of pipes. The plant is located at 251 Centennial Drive, across from the Carnegie Building. Harlow Sumerford, UT steam plant burns coal to heat campus, 6WATE.com, January 16, 2009. Vanderbilt's coal plant has three boilers. The plant produces electricity and provides heating and cooling to 5.8 million square feet of campus facilities. The plant receives its coal from eastern Kentucky. Vanderbilt sells fly ash from the plant to a mulch company. A German student studying at Vanderbilt told a student publication that one of his biggest surprises was “the incredible amount of energy Americans use every day. I arrived in July, when it was really hot outside,” he recalls, “but inside the buildings on campus, it was so cold I needed a sweater." The Morgantown Energy Facility - a 69-MW coal-fired cogeneration plant - supplies steam to West Virginia University, and supplies electricity both to the university and to other customers. The plant was built in 1991, and runs on "gob" (waste) coal. It is owned by Morgantown Energy Associates, which in turn is almost entirely owned by Dominion. ↑ "College Campuses Continue to Leave Coal Behind" Reuters, November 11, 2010. ↑ "Going geothermal; university plans to install the largest system in the country," Ball State University, February 6, 2009. ↑ College of Wooster Cogeneration System, District Energy Library, University of Rochester, accessed March 2009. ↑ "Cornell Cuts Coal", WBNG News, January 15, 2010. ↑ "Duke aims to cut coal use by 70%," Duke Chronicle, April 7, 2009. ↑ Samieh Shalash, "Hampton University seeking grant for geothermal system to replace coal-burning steam plants," Daily Press, May 26, 2009. ↑ "Coal Free IU launches week of action" Matthew Glowicki, Indiana Daily Student, January 10, 2012. ↑ 24.00 24.01 24.02 24.03 24.04 24.05 24.06 24.07 24.08 24.09 24.10 24.11 24.12 NETL Coal Power Plant Database, National Energy Technology Laboratory, U.S. Dept. of Energy, 2007. ↑ Jenni Wiener, "Miami to phase out coal use" The Miami Student, April 14, 2011. ↑ Jeff Gore, "New Student Campaign Targets UGA Campus Coal-Fired Boiler"City Pages, Oct. 14, 2009. ↑ Tim Burgess, "UGA responsible about steam plant" Online Athens, October 18, 2009. ↑ Sarah Giarratana, "Battle ongoing over future of UGA coal plant," Red & Black, Oct. 23, 2011. ↑ "UNC-Chapel Hill to end campus coal use by May 2020" UNC News, May 4, 2011. ↑ Caroline Merritt "Students protest on-campus coal plant" The Collegian, Oct. 20, 2011. ↑ Kurt Walters, "University under fire for use of coal" Charlottesville Daily Progress, Oct. 28, 2011. ↑ Joseph Liss, "Sierra Club Camps Out," Cavalier Daily, Oct. 27, 2011. ↑ "Power plant," accessed March 2009. ↑ "Southwest Campus Heating/Cooling System Planning," AEI Affiliated Engineers, VPI&SU, Dec. 2005. ↑ Kelsey Jo Starr, "Students rally for cleaner energy"Collegiate Times, Oct. 3, 2011. ↑ Sean Byrne, "Students protest coal plants on Virginia campuses" The JMU Breeze, Oct. 30, 2011. ↑ Rusty Dennen, "Activist urges students to act," Fredericksburg VA Freelance Star, Oct. 7, 2011. ↑ U.S. Environmental Protection Agency letter, date unknown. This page was last edited on 1 July 2017, at 18:02.